Inspired by the outrageous satirical posters and bizarre photographs of seaside entertainers Bob and Roberta Smith launches an absurd political campaign for more art. Before Screaming Lord Sutch there was Lord Charlie Banks! whose exploits are revealed by documents in the Folkestone Library Heritage Room. Charlie Banks was an employee of the Pleasure Gardens Theatre in the 1900's, and with his friends, paraded the town in fancy dress & animal costumes for the benefit of local charities. In his alter ego as political activist Banks produced spoof election posters. 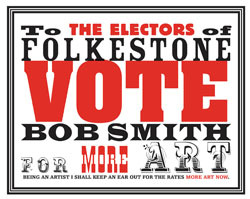 Taking a lead from Lord Banks, Bob and Roberta Smith will invite the electors of Folkestone to vote for him to build five new museums devoted to Art and he will declare Folkestone as City of Youth. Bring a picnic and for Bob and Roberta Smith's Grand Day Out on the 30 October 2004. Join in a series of competitions and experiments including Hills are the New Holes digging competition and Vegetable Portrait Bust competition. Then come along to the Metropole and hear Bob Smith play and sing My Husband Thinks He is a Musician, an ode to Charlie Banks and other songs inspired by the Local Studies Collection of Folkestone Library & Museum (also available on CD). There will be a poster to celebrate all the lost lateral thinking of the Victorian era. Bring a picnic and join in a humorous and quirky jaunt with a series of competitions and experiments. Wheelchair access. The library has an audio loop.